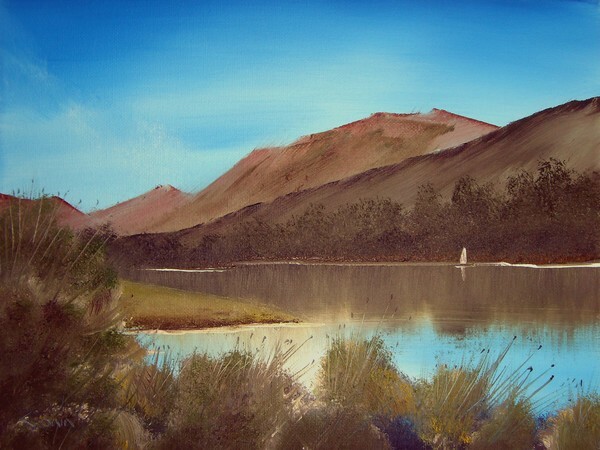 ORIGINAL OIL PAINTING BY STEVEN CRONIN "SAILING ON BUTTERMERE" ORIGINAL OIL PAINTING STRETCHED CANVAS READY TO HANG Thank you for looking at one of my new oil paintings. It has been stretched over a wooden frame and is ready to hang. Size is 12" inches x 9" inches x 3/4" inch deep. Not satisfied? Simply return within 30 days for no questions refund. Worldwide postage is included in the price. Thanks for looking. Best regards, Steven. Definitely enjoy your watercolours.love the free style with big brush strokes. nice splash of blue breaking through.